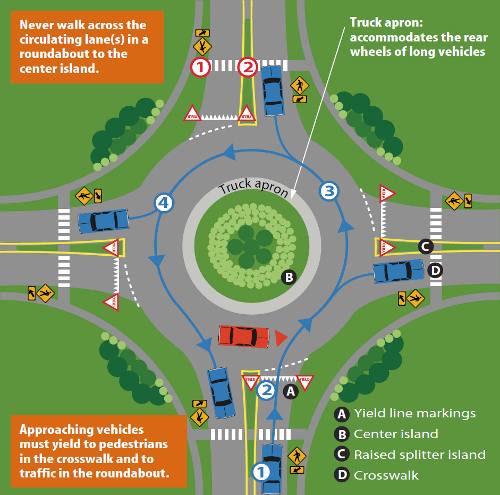 A roundabout is an uncontrolled intersection or an intersection controlled by road signs where traffic moves counterclockwise around a central island. Access to the roundabout is usually controlled by YIELD signs that may be duplicated with additional yield line pavement markings. 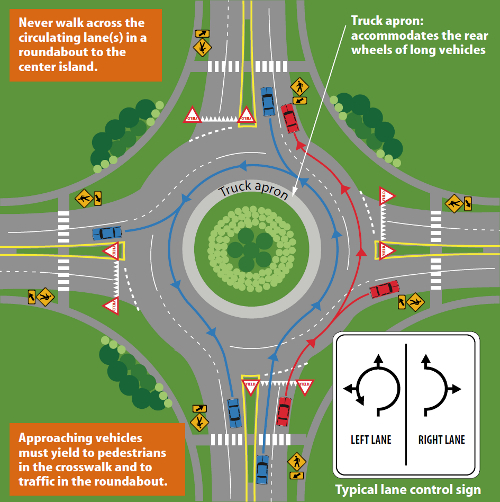 Roundabouts are one of the safest types of intersections since they are designed for low speed driving and all traffic is moving in the same direction and left turns across traffic are eliminated. 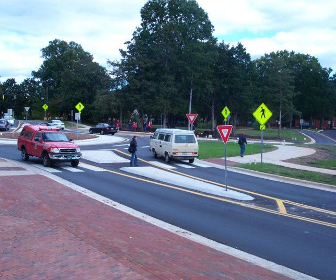 Roundabouts can also improve pedestrian safety by offering a short crossing of one-way traffic moving at slow speeds. Approaching the roundabout. Slow down before approaching the roundabout. If you see any pedestrians about to cross or crossing the street, let them pass before going through the crosswalk, pedestrians ALWAYS have the right of way at a roundabout. Proceed past the crosswalk once it is safe to do so. Make sure you are able to clear the crosswalk, blocking a pedestrian crossing is a traffic violation you can be cited for. Yield to vehicles and cyclists that are already on the roundabout. Enter a gap in traffic when you see one. Remember, you have to move in a counterclockwise direction. Proceed to the desired exit don't try to pass anyone at the roundabout and avoid stopping. Signal your intent to exit the roundabout. If there are pedestrians crossing the street at a roundabout exit, stop and yield to them before going through. If you missed your exit, don't panic and keep driving until you make another circle and return to the exit again. Driving through a multi-lane roundabout is a trickier than driving through a single-lane roundabout since you have to select the right lane depending on the exit you plan to take. Most two-lane roundabouts allow traffic in the right lane to turn right and go straight through the roundabout, while traffic in the left lane must go straight, turn left or return in the direction it came from. Most of the multi-lane roundabouts will have lane use control signs that will help you choose the right lane. Approaching the roundabout. Slow down and select the appropriate lane, depending on the exit you are planning to take. You must select the lane in advance while it is still allowed by pavement markings. Yield to any pedestrians crossing the street. Yield to traffic already on the roundabout, wait for a gap and enter it. You must enter the correct lane. Signal your intent to exit the roundabout as soon as you pass the street before your exit. If you are driving in the left lane, be aware of other vehicles that may be on your right. Yield to any pedestrians that may be crossing the street and exit the intersection. In most cases, bicyclists should dismount and walk their bicycles across the pedestrian crosswalk just like any other pedestrian. 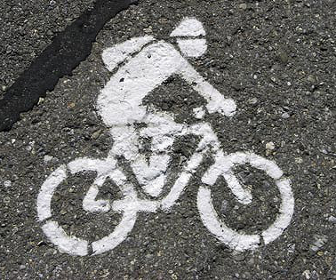 This is a safer option that should be chosen by most cyclists. Experienced cyclists may choose to cycle through the roundabout, obeying traffic rules just like any driver. You must yield to pedestrians and vehicles that are already on the roundabout. Ride in the middle of the lane so drivers will not be tempted to pass you. Avoid driving through multi-lane roundabouts, drivers traveling through the roundabout may not see you in their mirrors. 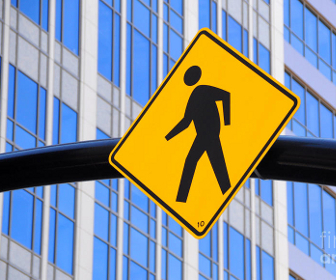 Pedestrians should only cross the street at a dedicated pedestrian crosswalk. Vehicles must yield to you, but do not assume the right-of-way, be prepared to yield if doing otherwise may place you in danger. Pay attention to vehicles exiting the roundabout once you are past the center line. 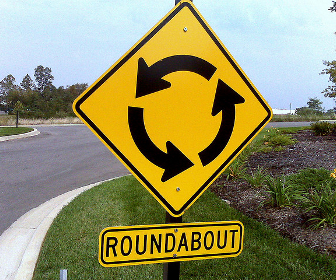 Most roundabouts are preceded by a warning sign ROUNDABOUT AHEAD (also known as the CIRCULAR INTERSECTION sign). The sign may be accompanied by an additional ADVISORY SPEED sign that will advise you on the recommended speed at this intersection. 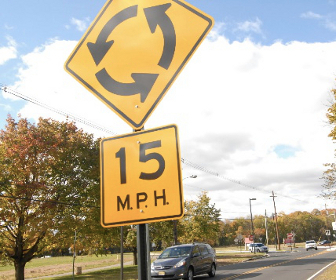 Most roundabouts were designed for speeds that do not exceed 15-20 miles per hour. Controlled roundabouts have yield signs at all entrances to the intersection, reminding drivers that they must yield to traffic that is already on the roundabout. Yield signs may be supplemented with yield-line pavement markings. 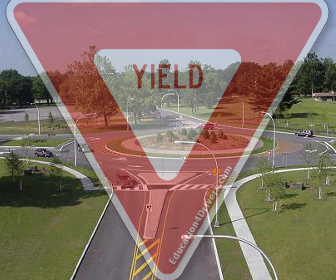 Note: even if you do not see a YIELD sign, you still need to yield to pedestrians and traffic on the roundabout. You may also see PEDESTRIAN CROSSING signs at crosswalks. Remember that even if you do not see these signs, you must still yield to all pedestrians crossing the street before you enter the roundabout.